A quiet Sunday in which I recovered from the Century yesterday - the fourth weekend in a row (!) - and while hanging out I plotted nefarious deeds in the upcoming week. Just kidding. And coded! Not kidding about that... whenever I have to get my hands dirty with actual programming these days, it is a pleasant bonus. Well the Amgen Tour of California kicked off today, a flat "sprint stage" from Nevada City to Sacramento, and to no one's surprise Mark Cavendish won a field sprint at the end, although he was pushed nicely by J. J. Haedo. The big news was that some of the big names hit the deck in the final circuits around downtown Sacramento, including Tom Boonen, George Hincapie, and Jens Voight. On to tomorrow's stage which features more climbing but will likely end in a sprint as well. 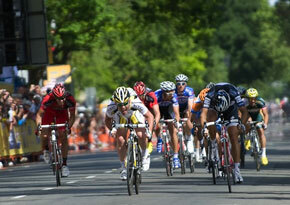 In the other big race taking place at the moment, Cadel Evans won stage 7 of the Giro d'Italia, and Alexander Vinokourov leads overall. Wow, could Vino really do it? Stay tuned. The other day I mentioned video chat as a cool future; reader Marc alerts me to the announcement of Sprint's upcoming HTC EVO 4G phone, which will have - ta da - video chat. We'll see whether it's a dancing bear, but it seems like it would be a big winner. Especially for, um, private chats... yeah. 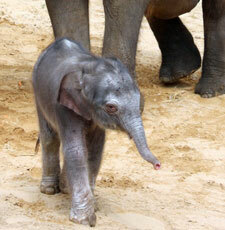 Wrapping up, here's the ZooBorn of the weekend: a baby elephant. Yeah I know we have had many little elephants and they are all really cute, but this little girl might be the cutest. Man they grow up fast.